Jars, pots and ancient manuscripts are what are generally found in archaeological excavations. 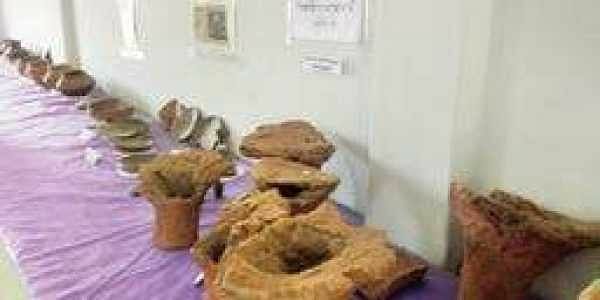 NAGAPATTINAM: Jars, pots and ancient manuscripts are what are generally found in archaeological excavations. But when students of the History department of TBML government-aided arts and science college of Porayar in Nagapattinam, carried out an excavation at Thalachangadu near Sirkazhi in 2005, they found a jar containing 400 gm of unknown seeds. After domestic agricultural institutes, including the Tamil Nadu Agricultural University (TNAU), failed to give the seeds a name, a UK-based private laboratory identified them as Aathu Kumatti. Professors and students have now embarked a journey to identify the usage of Kumatti seeds in the Sangam era. TBML college has 1,500 students and its History department is rated as the best in Bharathidasan University. The department has a museum of its own, which has been functioning for the last 20 years. Samuel Santhosam, head of History department, said they routinely carry out excavation on the banks of Cauvery up to 10 feet with the permission and cooperation of the Archaeological department. Santhosam said some of the artefacts in the college museum cannot be found even in State museums or other educational institutions in TN. “For example, the coin making box and two-legged stone table for making Siddha medicines of the third century AD are not available anywhere else in TN. We also found an unknown variety seeds in 2005 near Thalac-hangadu,” Santhosam said. “I was wondering why the seeds had not germinated and were just lying in a jar kept at a depth of 10 feet. When I approached the TNAU, they said were not familiar with the seeds. We approached several botanical labs but recently, scientists in the UK identified them as Citrullus colocynthis, commonly known as Aathu Pei Kumatti (River Ghost Kumatti) in Tamil, last year,” he said. “Thalachangadu finds a mention in the Tamil epic Silappathikaram, and the jar filled with Aathu Pei Kumatti could be around that age. We have started research on the usage of Aathu Pei Kumatti. While we checked with Siddha experts, they said Kumatti usually grows on riverbeds as well as crematoriums. In ancient days, crematoriums and graveyards were close to rivers, as after completing last rites, family members took a dip in the river. Kumatti is good medicine for headache, hair loss and is believed to have been a cure for smallpox.” Results would be published on the Kumatti in the Sangam period, he said.